Phyllis Schlafly Collegians is comprised of college students dedicated to promoting conservatism on college campuses by hosting knowledgeable speakers and authors, writing for campus newspapers, promoting and campaigning for local conservative candidates, speaking up in class, and participating in or starting conservative clubs on campus. 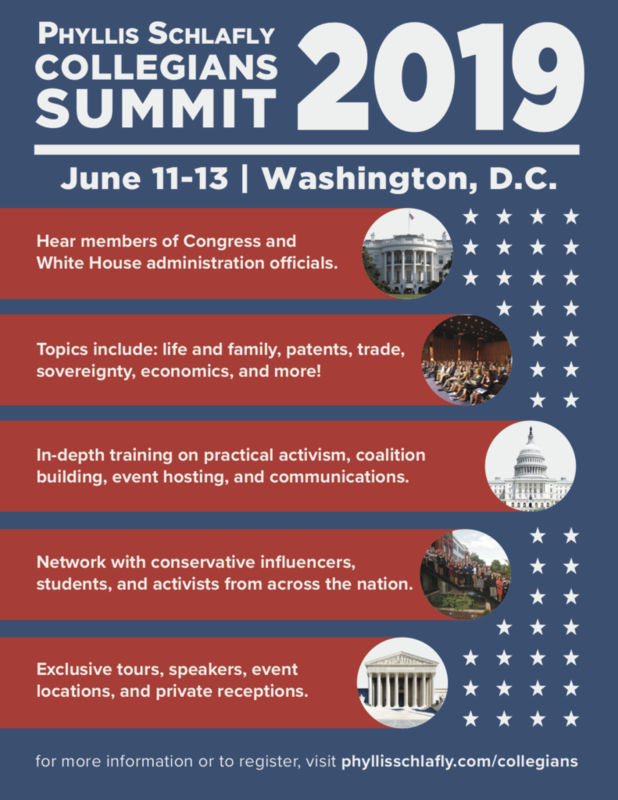 Phyllis Schlafly Collegians hosts an annual leadership summit in Washington, D.C. for college students from around the country. Students will network with conservative influencers, other students, and activists from across the nation. Participants will receive in-depth training on practical activism, coalition building, event hosting, and communications during this three day conference. There is no better place to hear directly from Members of Congress and White House and Executive Branch officials! Students will also have access to exclusive tours, event locations, and private receptions. This event is FREE for rising freshman, under graduate, and graduate students. There are a limited number of travel and lodging scholarships available each year.